I awoke early for some reason and went up to the pilothouse to watch the sun rise at 6:30. Unfortunately, it was very cloudy and foggy, so no sun was observed. The other ships in view were like ghost ships, barely visible through the fog. Foggy start to the morning. Just a different kind of beauty. Clouds starting to lift as the morning gives way to another day. A couple of pretty pictures of the morning serenity. A couple of our neighbors from the other cove get an early start. 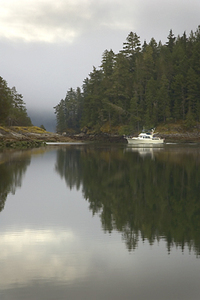 Today we headed for Handfield Bay, just off Cameleon Harbour in Thurston Marine Park. (The Canadians have this marine park thing locked and loaded—they do a great job of keeping the most gorgeous land in government hands so it can be enjoyed by all). 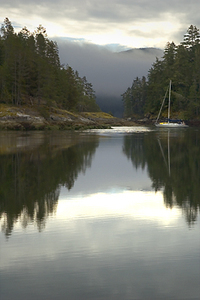 To get there, we had to transit Upper Rapids on Okisollo Channel at slack tide. This area has lots of rapids form where there are narrow passes, and they have strong currents and lots of white water. Best to transit at slack. When we went through it was super slack, nothing exciting to see. Turned into Discovery Channel and saw more traffic than we had in days, though not more than 5-6 boats. Turned again into Nodales Channel and started to look for Cameleon Harbour. Nodales Channel was so pretty….this entire area is tree lined to the waterline and full of mountains. Handfield Bay’s entrance required some careful navigation, there is a very narrow channel edged by rocks and shoals, so Captain Bob kept the boat right in the center. I admit to being a little distracted as there were two porpoises just off our starboard side and I wanted to watch them instead of where we were headed! There was a sailboat anchored in the middle of this small bay, and two powerboats rafted on the right side and stern tied to shore. 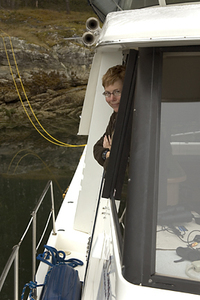 That left us a little maneuvering room on the port side of the bay, and we had a blast. We found a good spot to drop the anchor, just far enough away from the sailboat and then backed in close to shore and took a stern line ashore. That means launching the dinghy and having Bob “beach” it sort of on the rocks while I play mountain goat and climb and climb till I find a good tree or rock to attach the stern line too. No problem. We settled in to have lunch and watched as the 2 powerboats that were rafted decided to leave. Interestingly, both had anchors down. And you know what happened! The anchors became intertwined and it was a good source of entertainment to watch the two skippers hoist their anchors and untangle them. They were really cool about it and noted that they were the afternoon’s entertainment. "I got it". "No, I got it!" Closeup of the anchor spaghetti. 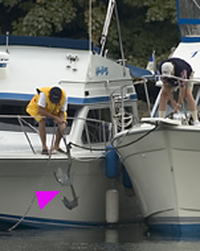 Pink arrow points to the two entangled anchors. We decided to rest on kayaking, so took the dinghy down to the head of Cameleon Harbour, checking out the 2 powerboats and 2 sailboats that were anchored there. A lovely spot, but not as cute and secluded as ours! As we passed by the anchored 40’ Nordhavn, we said hello and they told us they wanted to come into Handfield Bay where we were but it looked too crowded! I wanted to see the rest of the marine park so Bob got the seriously overpowered dinghy flying and, with our trusty portable GPS on the seat beside him, took off for parts unknown. It was a great day, we saw several blue herons and also found a great anchorage lagoon where the entrance dries at high tide but is safe inside. One sailboat had snagged that great anchorage all to itself. When you’re “on the hook”, you have to make all your meals…or I should say Bob does dinner and we share breakfast and I do lunch. Dinner was superb, chicken on the grill marinated in peanut butter and other stuff and red bliss potatoes roasted in the oven with fresh herbs. No hardship at Café Bob. Capt'n Bob at the helm of the versatile explorer dinghy. Best of Times sitting pretty in Handfield Bay along with the kayak named "Canoe". Karen and Best of Times from the dinghy.